This past weekend was spent the same way I’ve spent the fourth weekend of January for the past twelve years: in Philadelphia attending EduCon. EduCon is a relatively small conference that someone described as a popup community. It’s a community of smart, interesting, passionate educators who come from near and far to immerse themselves in discussions around many difficult topics about learning and society. Reflecting back on some of the sessions I was part of, I think I may have been a little repetitive. Possibly even obnoxious. I found myself asking the same question over and over: where are the kids in this process? You’re designing a new school? Why don’t you have students on the primary planning team? Based on possibly many years of experience, they likely have some strong opinions and wonderful insight. After all, they will be expected to do some serious work in these spaces. You’re revising the curriculum? Wouldn’t it be better if you included students who had taken the course in the past? Certainly there is a core of information, some of it required. But kids could tell you exactly what worked and what didn’t how that information is presented. You’re writing a mission and vision statement for your school? I’m pretty sure it’s going to say something about kids and their future. They should be on the core committee right along side of the administrators, teachers, and those other “stakeholders”. I’m pretty sure the people I used to work with were tired of hearing me regularly bring up the topic. The idea that students should be part of the teams that are responsible for planning the educational process that will have a major impact on their lives. In our overly-large school district, students might be brought in as part of focus groups later in the process, but their input likely didn’t have much influence. When a project reached the focus group stage, the major decisions had been made and this was just about tweaking things around the edges. Anyway, I never intended the question to be a criticism of anyone in the room at EduCon. And I think many members of this community are very aware that most schools and districts do a rather poor job of including students in their planning processes. I hope at least some of them will take the idea back to their workplaces and begin asking their colleagues, “where are the kids?” more often. The image is one I keep coming back to almost every year: looking down at the SLA cafeteria from the second floor. I’ll have to look for another view next year since the school and EduCon will be moving to a new building in the fall. Writing in the Washington Post, a teacher relates the story about what happened when she gave each of her third graders an iPad. And then she wished she could take the back. Her first disappointment came when her “lively little kids stopped talking and adopted the bent-neck, plugged-in posture of tap, tap, swipe”. Although I’m not sure why that was unexpected. It sounds like the behavior of 8 year olds with a new toy. Some of the problems she experienced with her class were technological – slow bandwidth, password issues – and should have been anticipated and planned for. But other issues that caused this teacher to regret this 1-1 program are clearly the fault of whoever in her school or district is leading it. She notes that the staff did do some planning in advance of the distribution. My colleagues and I had tried to anticipate all sorts of issues before the new tablet initiative rolled into our third-grade classrooms last year. What happens if the children lose them? Break them? Forget their passwords? How will we clean the screens? Charge them all at once? Which lessons lend themselves well to iPads, and which ones don’t? 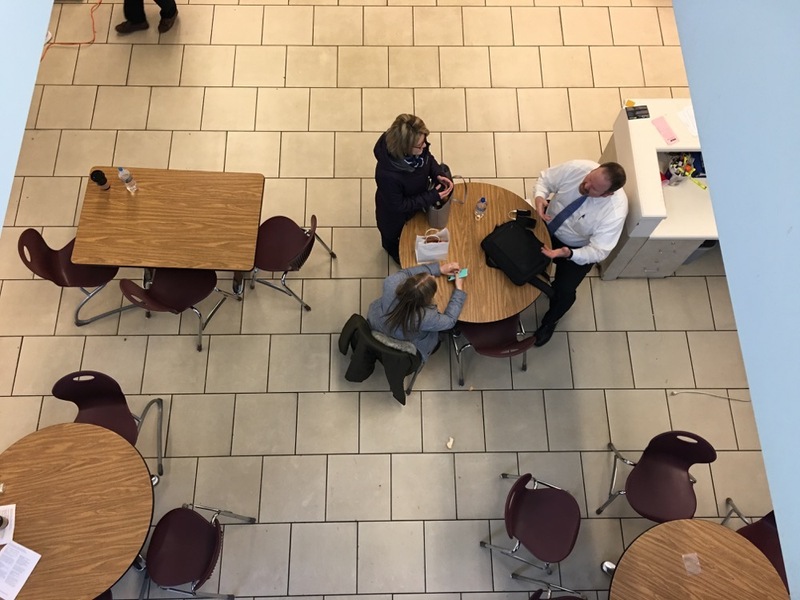 We had meetings, made plans and did our best to embrace the new – both because we had a sense of the potential and because asking questions about the efficacy of one-to-one classrooms (with a computing device for each child), or wondering aloud whether more tech for little kids was supported by research, was not only unwelcome, it was illogical. Notice that most of those questions involve logistics, not instruction. The fact that they were asking questions about whether the tech would be appropriate for students at that age is wonderful, but they should have had that discussion long before anything was purchased. Fairfax County, aka the overly-large school district and my former employer, is now working on a 1-1 program for the whole system and, when I left less than four months ago, the planning was almost entirely centered around those logistical issues. There was very little about the important parts: changing curriculum and pedagogy to align with the fact every student has a powerful, connected computing device. I hope that’s changed but I rather doubt it. The teacher relating her story in the Post spends the last half of the article reflecting on the “screen time” issue, returning to studies from OECD (tech doesn’t improve student learning) and the Campaign for a Commercial-Free Childhood (concerns about excessive time on devices affecting student development). At the end, she does appear to begin appreciating the fact that putting technology in the hands of students is not an all or nothing deal. But jumping from the “sage on the stage” teaching model to a screen for each kid skips over critical territory in between, where children learn from, and build their social skills with, one another. Classrooms run by worksheets won’t be magically transformed with tablets, and classrooms where teachers skillfully engage their students don’t need screens – and the extra baggage they introduce – to get great results. However, there is a middle ground between those two classroom scenarios. Between screens as simply a replacement for worksheets and no technology “baggage”. It takes a great deal of planning by everyone in the school, a willingness on the part of teachers to learn and to alter their instructional practice, and input from the students themselves, something that’s usually missing from 1-1 plans. This particular teacher wasn’t prepared for 1-1, and I rather doubt that most of my formerly colleagues in Fairfax will be either when the screens arrive in the their classrooms. Continuing on the topic of 1:1 device programs, Wired has a very good review of the lessons learned (and not learned) in the high-profile mess the leadership of Los Angeles schools created for themselves two years ago. Currently everyone involved is pointing fingers, with the LA superintendent blaming Apple, Pearson, and technology in general. While still buying an additional $40 million worth of iPads and Chromebooks to be used “exclusively for testing”. Michael Horn, an author and education consultant, hopes the expensive experience of LA “will get people to pause and learn the bigger lesson”. And what is that bigger lesson? I’ll be plastering that quote on the wall at the next 1:1 meeting I attend here in the overly-large school district. Horn goes on to note that ed tech vendors often “design their software in a vacuum” without understanding how their products might be used in a real classroom. Someone probably needs to remind them again that “moving forward” in education is least of all about “delivering devices”. Our superintendent has said several times in public statements that she wants a 1:1 program here in the overly-large school district. Although it’s not clear how she would pay for such a program, the super has established herself as someone who pushes big changes to happen sooner rather than later. So, trying to get out in front of the concept, we have been having a lot of meetings around what a 1:1 program would look like. But, since the IT speaks for instructional technology in our system by default, a large part of the discussion is about the type of device, how it will be deployed and managed, and how we keep kids from doing personal things on what is supposed to be personal machine. Which is completely the wrong conversation to be having at this point in the process. We first need to address a long list of questions related to instruction and weave in the technical pieces as needed. Why do we want every student to have a connected device in the first place? If our primary goal is improving test scores, we can probably find better, less expensive solutions. How should the curriculum and classroom practice change as a result of every kid carrying a powerful communications tool? If teachers continue to lecture, drill, and test based on a largely fact-based program, 1:1 would be a huge waste of money. Very similar to the way we’ve wasted a lot of funds on instructional computing over the past decade and a half. Maybe we should step even farther back and ask what’s the purpose of school? Schools certainly have a very important role to fill in our county but is it the same as only a few decades back when what an educated person needed to know was largely contained on paper and distributed by a few, specially qualified gatekeepers? Anyway, these are just a few of the issues that I would like to see our district (including teachers, students, parents, and community members) work on before the first dollar is spent on equipment and software for a 1:1 program. However, in the rush to maintain an illusion of relevance, I’m not at all confident we will stop to seriously consider the why before rushing off to work on the how. Remember when the superintendent for Los Angeles Unified School District had big plans to give an iPad to all 640,000 of their students? Well, they have a new superintendent. “I don’t believe we can afford a device for every student,” Cortines told the Los Angeles Times, “Education shouldn’t become the gimmick of the year.” Cortines added that LAUSD had never made a definitive plan for how teachers would have used the iPads during instruction, nor had it planned how it was going to pay for the tablets over time. I’m not sure what he means by education “becoming” the gimmick of the year since, for as long as I can remember, we’ve had a new gimmick almost every year. Sometimes more than one. And that gimmick was often some kind of technology, distributed with vague plans for instructional use, and no sustainable funding plan.